(Below) As a crew member follows standard procedure by acting as window lookout, the pilot of a 1st Helicopter Brigade CH-47JA kicks up the grass during the landing phase at Kisarazu in the late 1990s. The aircraft bears the native American/American Indian warrior’s head marking of the 2nd Helicopter Group and double yellow stripes, denoting the 2nd Flight, beneath the nose and on the sponson. Although perhaps not quite enjoying the same high profile as, say, JASDF fighter squadrons, JGSDF aviation units have quietly accumulated operational experience that can date back many years. The main listing is broken down first into numerical order by standard unit number. This is followed by the five anti-tank helicopter units, the elements under regional army command and then other elements, including aviation schools. Some text entries are still pending, others sketchy. In addition to photographic content, J-HangarSpace will gradually be adding more facts and figures, particularly those gleaned from the unit visits made over the years by the Japanese aviation press. Naturally, no account would be complete without some input from unit personnel. 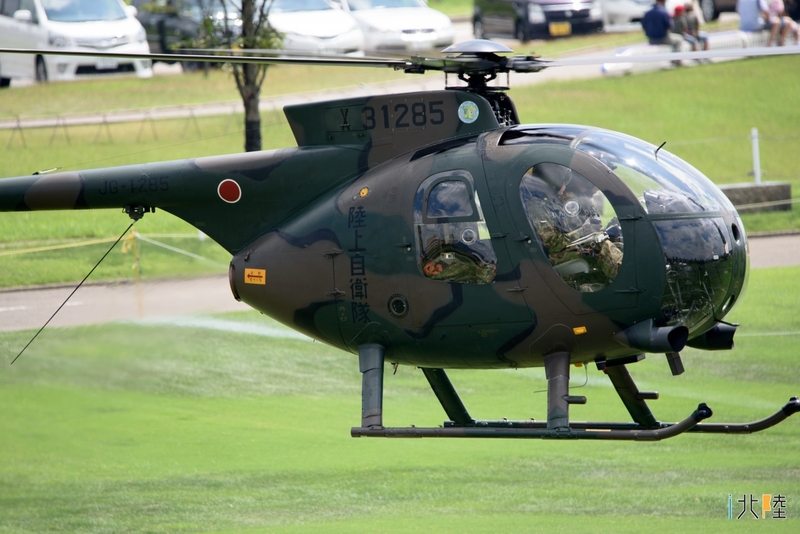 The intention is for the information to cover unit markings, and even the JGSDF is known to decorate its usually sombrely camouflaged aircraft with special colour schemes when the occasion merits. displayed at the Crossland Oyabe amusement park in Toyama Prefecture. Kawasemi (Japanese for kingfisher, Western Army Helicopter Squadron, 3rd Flight). Formed within the Akeno Aviation School on March 20, 1959, the 1st Helicopter Corps moved its Sikorsky H-19s and Vertol V-44As to Kasumigaura at the end of that month and was reorganized into 1st Helicopter Brigade on March 1, 1968 (see below). September 1971 and ended up at the Bihoro Aviation Park in Hokkaido. Formed from the 1st Helicopter Corps at Kasumigaura on March 1, 1968, the 1st Helicopter Brigade comprised two helicopter groups (herikoputatai), each made of two helicopter flights (herikoputahikōtai). There followed a phased relocation to Kisarazu, with the 1st Helicopter Brigade HQ and the 1st Helicopter Group moving on March 22 of that year. Accompanied by the 1st Field Maintenance Unit, the 2nd Helicopter Group’s 1st Helicopter Squadron followed on June 1, 1968, its 2nd Helicopter Squadron in August 1969. Declared at full strength on the KV-107 helicopter in March 1975, re-equipment with the CH-47J took place between March 1988 and March 1995; the first CH-47JA arrived in December 1998. The 1st Helicopter Brigade received its first OH-6Ds in March 1977. Placed under the command of the 1st Helicopter Brigade, the Special Transport Helicopter Squadron (see later) received its first AS332L in December 1986. 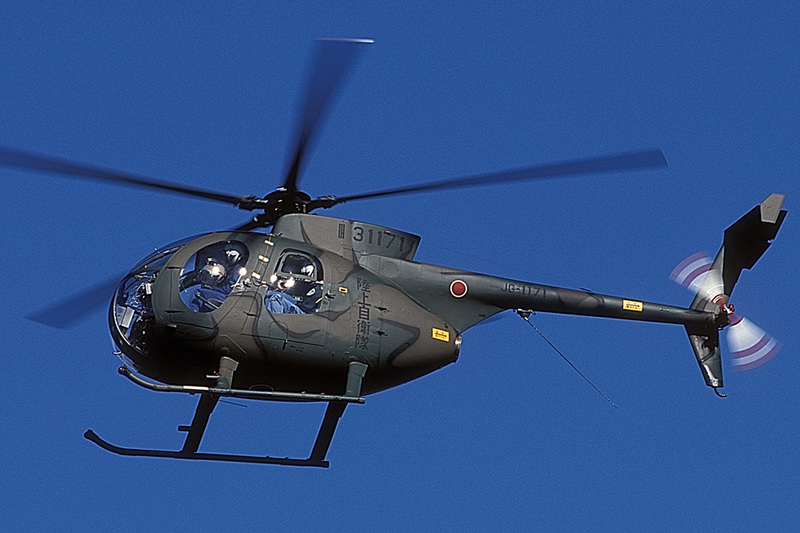 Equipped with the Fuji LM-1, a 1st Helicopter Brigade HQ command flight (Honbu Kanri Chūtai) was formed in 1974 and re-equipped with the LR-1 in March 1977 and the LR-2 in January 2000. A Liaison & Reconnaissance Flight was formed on March 27, 2006. Formerly reporting direct to Ground Staff Office, the 1st Helicopter Brigade was integrated into the command structure of the newly formed Central Readiness Force on March 28, 2007. Its first response was to combat forest fires in Yamanashi Prefecture on April 29, 2007. Further reorganization took place the following year, on March 27, 2008, when the 1st Helicopter Brigade was disbanded to make way for the 1st Transport Helicopter Group (see below), at which time the brigade’s two constituent (1st and 2nd) helicopter squadrons were reformed into four (103rd to 106th) eight-helicopter squadrons, confusingly now under the command of the 1st Helicopter Brigade. Over the 40 years of its existence prior to this reorganization, the 1st Helicopter Brigade played a key role in a number of disaster relief missions. Delivered in 1987 as the last of five aircraft supplied by Boeing in kit form, CH-47J 52905 rests in the sun at Tachikawa in November 1989. This was a time when the main JGSDF CH-47J fleet, still in its infancy, was devoid of unit markings except for the IH denoting the 1st Helicopter Group. Aside from the IH Roman numeral/letter combination applied aft of the cockpit windows, the sole identifying marking was a white stripe around the rear fuselage. Around the autumn of 1993, the 1st Helicopter Group, 1st Flight aircraft started to sport an all-black design incorporating the words Heliborne Fleet above 1H1F, a pair of laurel leaves and 1st Helicopter Brigade on their tail rotor masts. From circa October 1998, the Heliborne Fleet and 1st Helicopter Brigade appeared in white, the 1H1F in red and the laurel leaves in yellow. To ease unit identification, a short white stripe was applied to both the nose and at a rakish angle on the front of the fuselage-side sponsons. In around September 1999, the design was changed to a simple, white-shadowed red “1” wrapped by a lightning flash. The latter motif is associated with the Katori Shrine in northern Chiba Prefecture, where the god of thunder is believed enshrined. The design was flanked by the words Katori and Flight, in white, and above the base name, Kisarazu, also in white. Aside from the IH Roman numeral/letter combination applied aft of the cockpit windows, the sole identifying marking was a double white stripe around the rear fuselage. To ease unit identification, two short white stripes were placed on both the nose and front of the fuselage-side sponsons; different shield background colours (blue, orange) signified individual aircraft maintenance crews. (Above and below) In 1986, the 1st Helicopter Brigade experimented with low-visibility colour schemes. who had won a lottery for a flight over Tokyo Bay, a tradition that continues to this day. Aside from the IIH Roman numeral/letter combination applied aft of the cockpit windows, the sole identifying marking was a white stripe around the rear fuselage. In October 1998, this unit decided to adopt a tail rotor mast marking featuring the long-nosed goblin and famed swordsman Tengu, who is currently also gracing the tails of JASDF 304th Squadron F-15J/DJs. Coloured to signify the aircraft’s maintenance crew, a maple leaf was placed behind Tengu’s red and black face, the unit’s radio call-sign AKAGI below. (Tengu statues can be found on Mt. Akagi in Gunma Prefecture.) Initially, the whole design was on a white background but was toned down, the word AKAGI appearing in white-outlined and then solid black. To ease unit identification, a short yellow stripe was applied to both the nose and, at a rakish angle, on the front of the fuselage-side sponsons. Aside from the IIH Roman numeral/letter combination applied aft of the cockpit windows, the sole identifying marking were two white stripes around the rear fuselage. Reconnaissance Flight LR-2s incorporates the abbreviation of its commanding 1st Helicopter Brigade. The 1st Transport Helicopter Group was formed from the 1st and 2nd helicopter brigades on March 28, 2008. On that day, the brigade’s two former constituent helicopter units were officially reformed into four (the 103rd to 106th) eight-helicopter squadrons—alongside the newly formed, direct reporting 102nd Squadron’s UH-60JAs—under the overall command of the surviving and reconstituted 1st Helicopter Brigade. The natural disaster response traditions of its predecessor have continued, most prominently in the aftermath of the Great East Japan Earthquake and tsunami of March 2011. In TV news scenes reminiscent of the Chernobyl nuclear disaster of 1986, CH-47s were shown dropping water onto the stricken reactors at the Fukushima nuclear power station complex. The 1st Transport Helicopter Group hosted an event to mark the end of an era on February 15, 2016, when the last LR-1 (22019) made its final flight, from Kisarazu. On May 8, 2017, the 1st Helicopter Brigade deployed eight CH-47J/JAs from its 1st Transport Helicopter Group, supported by five fuel tanker vehicles, to combat a forest fire that had broken out in the hills around Kamaishi, Iwate Prefecture. Over a successful five-day operation, the unit’s aircraft dropped a total of approximately 3.8 million litres of seawater in 759 drops. In April and May 2017, the unit was deployed twice to Fukushima Prefecture, its firefighting efforts being recognized by the presentation of a certificate of appreciation from the prefectural governor in June. What had started out as the National Safety Force’s 1st Aviation Corps, 1st District, became the JGSDF’s 1st Aviation Corps, 1st District, on July 1, 1954, and moved to Kasumigaura in July 1955. Re-designation as the 1st Aviation Squadron under the command of the Eastern Army Aviation Group followed on January 18, 1962. 1st AvSqn aircraft seen at Tachikawa in May 1980: (Above) An L-19E-1 and a distinctive OH-6D. Moving from Kasumigaura to Utsunomiya on November 30, 1962, the move to its current base of Tachikawa was made on May 3, 1973. Its time under the command of the Eastern Region Aviation Group came to an end when disbanded and reformed under the 1st Division in March 1994. This photo shows a 1st AvSqn OH-6D overflying Gifu in November 1998 (link). marking signifying the unit’s attachment to the 1st Division. What had started out as the National Safety Force’s 2nd Aviation Corps, 2nd District, became the JGSDF’s 2nd Aviation Corps, 2nd District, on July 1, 1954. Re-designation as the 2nd Aviation Squadron under the command of the Northern Army Aviation Group followed on January 18, 1962. Regional aviation group command was supplanted by direct ground divisional command in March 1994. In mid-October 2017, the most recent addition to the squadron’s gallery page on the Northern Army website (link) was of a forest fire containment operation undertaken in the Yonehara district of eastern Asahikawa in May 2015. The 2nd AvSqn marked the achievement of 10,000 accident-free flying days on May 31, 2013. Having started life as the National Safety Force’s 3rd Aviation Corps, 3rd District, the unit became the JGSDF’s 3rd Aviation Corps, 3rd District, on July 1, 1954, and moved from Hamamatsu to Yao two months later. This photo shows a 3rd AvSqn Stinson L-5 (link) parked next to a JASDF F-86D at the unit’s former base of Hamamatsu in March 1958. As part of a major JGSDF re-organization, the unit was re-designated as the 3rd Aviation Squadron under the Central Army Aviation Group on January 18, 1962. 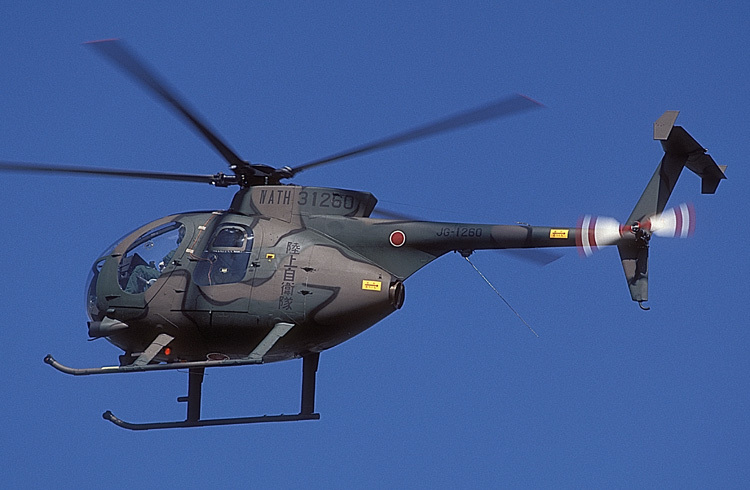 One of the squadron’s OH-6Ds is seen here at Gifu in November 1999 (link). Comprising a Roman numeral III flanked by white wings (below), this then newly adopted emblem (link) was seen on a 3rd AvSqn UH-1J at Senzo Army Camp in May 2007. According to the unit’s Japanese-language website (link), having been formed as the NSF’s 4th Aviation Corps, 4th District, on January 10, 1954, the unit was re-designated simply as the 4th Aviation Corps on September 10 of that same year. Other sources imply that the unit retained its name to become the JGSDF’s 4th Aviation Corps, 4th District, when the service was established on July 1, 1954, and state that the 4th District formed the nucleus of the re-designated Western Region Aviation Corps at Ozuki on January 25, 1956. Responsible for operations in the four prefectures of northern Kyushu (Fukuoka, Saga, Oita and Nagasaki), the unit has been based at Metabaru since relocating there, at that time still as the 4th Aviation Corps, from Ozuki on November 26, 1956. On January 18, 1962, the unit was re-designated as the 4th Aviation Squadron under the command of the Western Army Aviation Group that formed to replace the Western Region Aviation Corps that same day. The 4th’s long association with the regional command came to end on March 28, 1994, when assigned to a division-level JGSDF ground unit, the 4th Division. A 4th AvSqn OH-6J sports the typical colour scheme of the day at Tsuiki in November 1976. The 4th was re-equipped with the UH-1J on March 27, 2003. The unit’s Japanese-language website (link) confirms the 5th’s establishment as a JGSDF aviation corps at Asahikawa in September 1954 and that the unit moved to Obihiro that same month. Its Obihiro home base was named Tokachi airfield in 1981. Re-designated as the 5th Aviation Squadron under the Northern Army Aviation Group on January 18, 1962, the formation of the unit’s “B” Flight was completed in March 1977. Regional aviation group command was supplanted by direct ground (currently brigade-level) command in March 2004. The unit received its first two examples of the then new OH-6J in March 1972 and its first three UH-1Bs in November 1976; the first UH-1J arrived in September 1995. A significant milestone was recognized with an award in July 1989, when one of the unit’s helicopters had notched up 3,000 mishap-free flying hours. Among the more location-specific tasks conducted by the 5th are the supporting of ice floe monitoring operations, which the unit commenced as long ago as February 1957, and surveying the habitat of the local feathered variety of crane in the spring. The recipient of letters of appreciation for its accident prevention activities, the 5th was naturally heavily involved in the response to the Great East Japan Earthquake in March 2011, as at mid-October 2017 still the last squadron chronology entry on the website. Having formed at Kasumigaura, the then 6th Aviation Corps moved to Kasuminome in October 1955 and has been permanently resident at Jinmachi since March 6, 1969. The unit was re-designated as the 6th Aviation Squadron under the Northeastern Army Aviation Group on January 18, 1962. Following the March 1994 reorganization, the 6th AvSqn parted company from the Northeastern Army Aviation Group to join forces with the 6th Division. This unit was first designated as the 7th Aviation Squadron when placed under the command of the Northern Army Aviation Group on August 15, 1962. That chain of command was only broken when supplanted by direct ground divisional command on March 28, 1994. Joined by its sister unit (now the 11th AvSqn) in January 1962, the 7th AvSqn has been stationed at Okadama for 55 years. The unit marking of the 7th AvSqn comprises a stylized red Roman numeral seven (VII), denoting its commanding 7th Division, and a white feather. Superimposed in yellow is 七飛 (seven, fly), an abbreviation of the unit designation 第七飛行隊 to denote allegiance to that command division. The unit’s long association with the city of Sapporo is also recognized. Formed on the day a major JGSDF reorganization came into effect, the 8th Aviation Squadron immediately came under the control of the Western Army Aviation Group. Its initial equipment was the L-19 Bird Dog. Responsible for operations in southern Kyushu, the unit relocated to Takayubaru in 1971 and was eventually placed under divisional command in 1996. One of the squadron’s OH-6Ds is seen here at Gifu in September 1999 (link). The 8th AvSqn badge, found on the OH-6J standing gate guard at Utsunomiya in May 2013. Sources differ as to when the former 9th Aviation Corps officially came into being: another states September 27, 1956. Whenever that may have been, there is no doubt that re-designation as the 9th Aviation Squadron took effect on January 18, 1962. Following the March 1994 reorganization, the 9th AvSqn had parted company from the Northeastern Army Aviation Group to join forces with the 9th Division. An OH-6D from this low-profile unit was present at JASDF Misawa in September 2005 (link). J-HangarSpace has yet to confirm at what stage the 9th AvSqn moved from Hachinohe, its base since March 1957, to its current base at Aomori. Yet again, sources differ on the formation date of what was originally the JGSDF’s 10th Aviation Corps. Although some state June or July 1958, the unit website’s sketchy Japanese-language chronology (link) puts the ubugoe (newborn baby’s first cry) at Akeno as late as at some stage in 1961. Re-designation as the 10th Aviation Squadron came on January 18, 1962, as did a move from Hachinohe to Akeno. According to the unit’s website, found via that of its commanding 10th Division (link), it was here that the 50th anniversary was marked on January 18, 2012. A fine study shows an OH-6D from the unit coming in for a landing at Akeno in October 1997 (link). Following the March 1994 reorganization, the 10th AvSqn parted company from the Central Army Aviation Group to join forces with the 10th Division. The unit’s area of responsibility thus matches that of the division and covers the six prefectures that form the Tokai and Hokuriku regions. 10th AvSqn OH-6D 31306 parked at JASDF Komaki AB in February 2014. The unit’s aircraft have been known to carry the 10th’s badge, as was seen on the door of a UH-1J that visited Hisai Army Camp, Mie Prefecture, in April 2013 (link) and beneath the main rotor on this OH-6D (link), which visited the Crossland Oyabe (link) Helicopter and Fire/Crime Prevention Festival in August 2016 . The design features the mythical half fish, half tiger creature known as a shachihoko, which adorns the corners of Nagoya Castle (and the tail fins of JASDF C-130Hs flown by the Komaki-based 401st Sqn). Filmed in June 2015, this video (link) shows a pair of UH-1Js coming into land; another (link) recorded flight training at Akeno airfield in August 2017. What is today the 11th AvSqn has its origins in the Artillery Brigade Aviation Corps that was formed at Kita-Chitose Army Camp* outside Sapporo in January 1954 and renamed the 1st Artillery Brigade Aviation Corps upon the founding of the JGSDF that July. undergoing maintenance and an H-13, the 11th’s equipment during its formative years. Coinciding with the formation of the 11th Division, the 11th AvSqn was newly established in January 1962 alongside the 7th AvSqn (until that month the former 7th Aviation Corps) at Okadama. The formation of a “B” Flight brigade squadron was completed in March 1978. Regional aviation group command was completely supplanted by direct ground (currently brigade-level) command in March 1994. A crew member looks down from one of the squadron’s OH-6Ds upon departure from Gifu following maintenance in November 1999 (link). (*) The 11th Aviation Squadron page on the 11th Brigade website (link) mentions Kita-Chitose in the text and Higashi-Chitose in the chronology; the unit’s own page (link) states Kita-Chitose. Having newly formed at Kasumigaura in January 1962, the 12th AvSqn moved to Kita-Utsunomiya the following November. Regional aviation group command was supplanted by direct ground (currently brigade-level) command in March 1994. A 12th AvSqn, 2nd Flight CH-47JA bathed in autumn sunshine at Tachikawa in November 2013. A new unit marking (above) first appeared on tail rotor masts in August 2002. The design comprised a yellow eagle (ostensibly in flight but looking as if balancing) on a red katana (Japanese sword) with a white hilt. Extreme variations are used from time to time, such as this (link) seen at the Soumagahara base event held during the cherry blossom season in April 2008. 12th AvSqn aircraft at Tachikawa in November 2013. Also in August 2002, the 2nd Flight adopted the kanji 武飛 (literally meaning “military flight,” the 武 being in a stylized form of red and yellow gradations), which appears low down aft of the cockpit doors. The nose markings of a 12th AvSqn, 2nd Flight CH-47JA at Narashino in January 2012. All aircraft carry the unit identifier XII H in black aft of the cockpit windows. A 12th AvSqn, 3rd Flight UH-60JA pilot’s helmet bears the imposing hiryū (flying dragon) squadron badge. At times, the badge appears on the aircraft, such as this low-visibility version in 2005 (link) or with the hiryū on a red background with a yellow diagonal stripe in 2011 (link). In April every year, the 12th Brigade marks the anniversaries of its formation and of the establishment of a JGSDF camp at Soumagahara. In recent years, this has involved its assigned aircraft sporting special markings. In 2015, a Chinook was suitably adorned (link) to mark the 14th and 56th anniversaries, respectively. A close-up of the marking on the side of the aircraft can be found here (link). In 2016, an OH-6D had received treatment in time for the 16th anniversary (link). The towing of a “sharkmouth” Chinook from a hangar (link) on the 12th Brigade’s 13th anniversary in April 2014. The local Gunma Prefecture newspaper, the Jomo Shimbun, recorded the first training flights of the year in January 2016 (link) and 2017 (link). 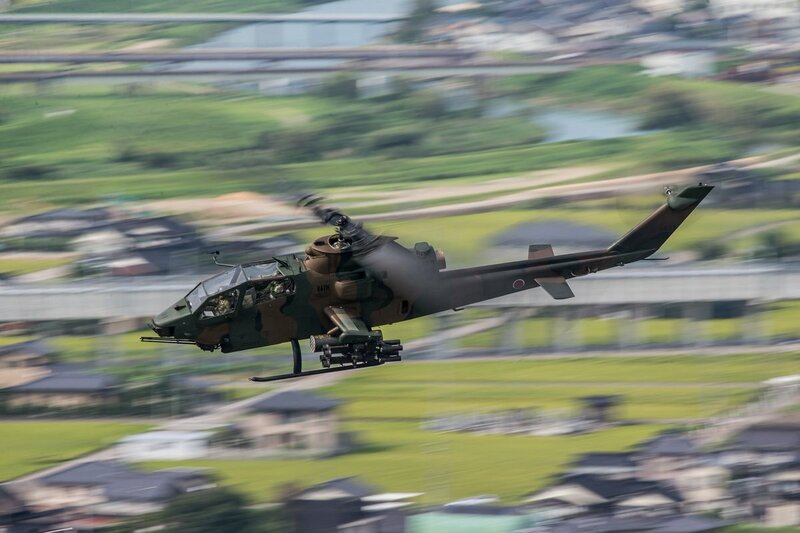 For the former, a total of nine helicopters climbed to an altitude of about 1,000 metres, routed over the cities of Shibukawa, the prefectural capital Maebashi and Takasaki before returning to base around 45 minutes later. The 13th AvSqn moved to Hofu in November 1962, the same year in which the unit was formed at Yao. The 13th Aviation Squadron thus provides logistic support throughout the 13th Brigade’s area of operations. As shown on a page on the Brigade’s website (link), these cover the five most westerly prefectures on Honshu, from Tottori to Yamaguchi. The most recent involvement in the website’s list of disaster relief deployments (link), which dates from the formation of the Brigade in 1999, was for the Kumamoto Earthquake of April 2016, the magnitude of which prompted a response from outside Kyushu. Bearing the inscription 13th Aviation and the name of its crew chief (C/C Yoshihiko Iwomoto), this 13th AvSqn was a visitor to the Swell Festival event at JMSDF in October 2014 (link). A history page on the 13th Brigade’s website (link) offers a glimpse back 40 years, to river rescue training held in Wakayama and Hiroshima prefectures in 1978. Its formation stemming from that of the 14th Brigade under the 2nd Composite Brigade, the 14th AvSqn is the first JGSDF aviation unit to be permanently based on Shikoku; previously, the island had been provided with Central Army Aviation Group aircraft from Yao, Osaka Prefecture. It was there that a preparatory unit was formed within Central Army Aviation Group in March 2009. The unit’s first major disaster response operation came on August 30, 2010, five months after its formation. The 14th AvSqn was called upon to assist in evacuating residents and bringing under control a forest fire on Shodo Island on the Inland Sea. The 14th AvSqn would be a contender for any future J-HangarSpace Best JGSDF Website award. Unlike most of its longer established sister units, the 14th AvSqn (or rather its parent 14th Brigade) makes full use of its website to provide news and show snapshots of life at the unit. Its homepage (link) serving merely as a contents page, aviation content is primarily to be found on the Gallery page (link), which divides the current fiscal year (from April to March) by month. Images from previous years, which date back to those taken at the unit’s formation ceremony (link), are kept here (link). Unit members come and go, as do their aircraft. (Above) A ceremony marking a pilot’s last final flight (in this case of a Captain Kono) followed the time-honoured tradition in April 2014. (Below) The OH-6D 254 was given a good send-off on February 12, 2015. The banner included messages for a job well done from its pilot and/or crew chief. Training exercises make up a high proportion of the unit’s operations. (Above) Another photo opportunity followed the end of door gun firing training in July 2013, which involved the use of targets placed in the sea off Cape Sata, the southernmost point of mainland Japan. (DDH-181) during a joint U.S.-Japan exercise held in February 2014. Formed from the disbanded 101st AvSqn (see below) on March 26, 2010, and trading in its last LR-1 (22019) for an LR-2 two months later, the 15th AvSqn was in existence for only three years, disbanding on March 25, 2013. Within that time, the 15th AvSqn had increased the cumulative total of medical evacuation missions by 555 to 8,313 and the number of people airlifted in the course of those missions by 560 to 8,673. Following the ceremonial handing over of a unit flag from the 15th Brigade, to which it reports, the 15th Helicopter Unit officially came into existence on March 26, 2013 (above). The 15th is organized into an HQ Flight with two LR-2s (above) and the 1st Sqn (UH-60JA) and 2nd Sqn (CH-47JA). The unit’s homepage (link) has four subpages. These provide an introduction to its roles/organization and aircraft as well as an overview of its medical evacuation operations and a chronology that dates back to the beginnings of the 101st AvSqn in 1972 (see below). A reporter from the local Uchinaa News visited the unit to join the first training flight of the year on January 11, 2017, during which he took an aerial view of the ramp at Naha (link). JGSDF’s 9,000th medical evacuation mission in Okinawa on October 4, 2016. Incorporating the Roman numeral for ‘15’, the 15th Helicopter Unit’s aircraft bear the alphanumeric code XVH. The unit has retained the tail marking of its predecessor, the 15th AvSqn. In white, the marking combines a map of the main island of Okinawa with a crested serpent eagle that inhabits islands in Japan’s westernmost extremities. The background of the full version of the unit marking (above) incorporates in yellow the family crest of the Ryukyu dynasty, to convey Okinawa’s origins as a separate empire, and the blue of the sea. Depicted in red is a local Naha landmark, the Shurei Gate, which also features on a 15th Brigade service medal. In January 2017, one of the LR-2s was sporting a bird over Okinawa tail marking design (link). A continuous thread running through the JGSDF presence on Okinawa has been its role in medical evacuation across the scattered islands of the island chain; the 101st recorded its first mission (to Aguni Island) on December 6, 1972, very soon after its formation. The 1,000th mission milestone was achieved on July 27, 1979, the 2,000th on November 28, 1984, and the 3,000th on October 7, 1989. A low point in the unit’s history came on the 3,080th mission on February 17, 1990, when an LR-1 crew was tragically killed when their aircraft crashed into the sea off Miyako Island at night in poor weather conditions when arriving to collect a patient. Re-equipment in the form of the CH-47J—actually 52901, the first example the JGSDF had received in 1986—and UH-60JA (43107) came on February 7, 1996, and October 6, 1999, respectively. The last example of the KV-107 (51818), a type long associated with the 101st, left Okinawa on March 17, 1998; the UH-1H (41684) followed suit on November 26, 2002. The first LR-2 (23053) arrived on December 15, 2000. A flight to Yoronjima in Kagoshima Prefecture on August 14, 1998, marked the accomplishment of the 5,000th medical evacuation mission. In July 2000, the 101st was naturally involved in supporting the G8 Kyushu-Okinawa Summit. During the approach phase on another medical evacuation operation, tragedy struck once again on the night of March 30, 2007, when the unit’s CH-47JA crashed on Mt. Amagi on Tokunoshima in Kagoshima Prefecture in poor weather conditions. Many local dignitaries paid their respects at the funeral service held for the four men who lost their lives on April 15. The curtain came down on the 101st’s long-standing presence in Okinawa on March 25, 2010, when the 1st Composite Brigade disbanded. The 15th AvSqn assumed the mantle the following day. At the end of its tenure, the 101st’s cumulative totals of medical evacuation missions and the number of people airlifted in the course of those missions had reached 7,758 and 8,113, respectively. The Kisarazu-based 1st Transport Helicopter Group hosted an event to mark the end of an era on February 15, 2016, when the last LR-1 (22019) made its final flight. Up until May 20, 2008, the same aircraft had been the last of its type to be based with the 101st Aviation Squadron on Okinawa. Such was the aircraft’s close association, another aircraft was painted to masquerade as 22019 and be put on display. Reporting directly to the 1st Helicopter Brigade rather than the 1st Transport Helicopter Group, the 102nd AvSqn newly formed in March 2008. The unit is charged with maintaining close cooperation with ground forces and would, if called upon, assume combat support roles, such as air mobility and reconnaissance. returned 102nd AvSqn OH-6D away from its landing point. Otherwise devoid of markings, aircraft assigned to the 102nd AvSqn carry the 1st Helicopter Brigade’s identifier, IHB. exception was made for a 102nd AvSqn UH-60JA at Kisarazu’s 40th anniversary show in October 2012. Previously the 1st Helicopter Brigade’s 1st Flight, what has been the 103rd Squadron since March 2008 has retained the name Katori Flight first adopted in 1999. The unit’s aircraft bear a low-visibility black, smaller version of the predecessor 1st Helicopter Brigade, 1st Flight’s “1” wrapped in a black lightning flash on the rear rotor mast. No longer sporting single unit identification stripes, HGPIII appears in black aft of the cockpit windows. Both taken at Kisarazu in early June 2010, the last two photos here (link) show the tail markings from two 103rd AvSqn aircraft. Previously the 1st Helicopter Brigade’s 2nd Flight, what has been the 104th Squadron since March 2008 has retained the Owl Squadron Azuma name first adopted in November 2002. A 104th Sqn CH-47J seen taxying at Kisarazu in mid-October 2012. Dropping its predecessor’s shield marking, the unit went back to the original idea of an owl alone, which was made more elaborate and embellished with a white-outlined black/red 104AVN above AZUMA. No longer sporting the twin unit identification stripes, HGPIV appears in black aft of the cockpit windows. Previously the 2nd Helicopter Brigade’s 1st Flight, what has been the 105th Squadron since March 2008 has retained the Akagi name first adopted in October 1998. A 105th Sqn pilot holds CH-47J 52915 at the hover at Kasumigaura in May 2014. The unit retains its predecessor’s marking that features the long-nosed goblin and famed swordsman Tengu, who is currently also gracing the tails of JASDF 304th Squadron F-15J/DJs. Coloured to signify the aircraft’s maintenance crew, a maple leaf appears behind Tengu’s red and black face, 105Avn to the right and the unit’s radio call-sign AKAGI in black below. (Tengu statues can be found on Mt. Akagi in Gunma Prefecture.) HGPV appears in black aft of the cockpit windows, the previous single yellow identification stripes having been removed from the nose and the front of the fuselage-side sponsons. Previously the 2nd Helicopter Brigade’s 2nd Flight, what has been the 106th Squadron since March 2008 has retained the Kazusa Flight name and marking first adopted in 1993. To fall into line with its sister units, the distinctive marking adopted by the predecessor unit—the head of a native American/American Indian with a black, white, red and yellow feather headdress in front of crossed arrows—was moved from either side of the nose to the tail rotor mast. The warrior still faces forward on both sides of the aircraft above the call-sign Kazusa; to the right is stencilled 106Avn. HGPVI appears in black aft of the cockpit windows, the previous double yellow identification stripes having been removed from the nose and the front of the fuselage-side sponsons. The first of the five anti-tank helicopter units that formed at two-yearly intervals was deployed to the Northern Army region in 1986, when the major potential military threat was still a land invasion by the then Soviet Union. Each 18-aircraft unit was planned to comprise two (1st, 2nd) flights and an HQ Flight. In the case of the 1st ATH, the latter was also initially equipped with two OH-6Js, but the HQ flights of all five squadrons have since converted from the later OH-6D to the OH-1. According to the unit’s single page on the Okadama Army Camp website (link), a 10-man office headed by a colonel was set up in March 1985, five months before a dedicated unit was established on site to oversee the preparations for the 1st ATH’s formation. The first AH-1S arrived in September 1985, the first OH-6J in February 1986. The installation of an AH-1 simulator was completed at Obihiro in March 1989. The 1st ATH utilized live-fire training facilities in the United States during joint exercises at the Pohakuloa Training Area in Hawaii (November 1992) and at the Yakima Training Center in the state of Washington (September 1998, September 2006). The unit’s turns to participate at the SDF live-fire demonstrations at the Fuji training area came in August 2000 and August 2005. More recently, the unit was involved in missile launch training with JGSDF AH-64 Apaches in May 2012 and sent to the United States for training again two months later. Having accepted delivery of its first OH-1 (the 14th built) in November 2002, the construction of a dedicated OH-1 hangar was completed in February 2004. The unit’s OH-1s were involved in the practice firing of an air-to-air missile based on the Type 91 portable anti-aircraft missile in September 2012. A series of photos taken on March 12, 2016, when the unit held a ceremony to mark its 30th anniversary can be found here (link). One of the AH-1Ss was painted in winter camouflage, a practice that had reportedly not been seen since 2011. In October 2017, the website still featured a group of photos recording AH-1S training in the United States in July 2014 and a launch of the air-to-air missile from an OH-1 in September the same year. The 1st ATH provided reconnaissance support during relief operations in the aftermath of the Mt. Usu eruption in Hokkaido Prefecture in April 2000 and provided support for the G8 summit held at Lake Toya, also in Hokkaido Prefecture, in July 2008. A search of Japanese Google in October 2017 unearthed only one reference, dated July 2014, when the Aomori Prefectural Government requested to know what had led to a rubber seal falling off an aircraft in flight and also that measures be taken to prevent a recurrence. When time permits, J-HangarSpace will add any information found in the aviation press, for example a JWings report, albeit from mid-2006, on the unit’s OH-1 operations. In the meantime, a selection of photos from Japanese aviation websites that feature aircraft from this “mystery” unit. One site offers a collection of photos, posted during the course of 2017, of 2nd ATH AH-1S aircraft during displays at JASDF Matsushima in August 2006 and at the JMSDF Hachinohe base open days in September 2006 and September 2009 (link). 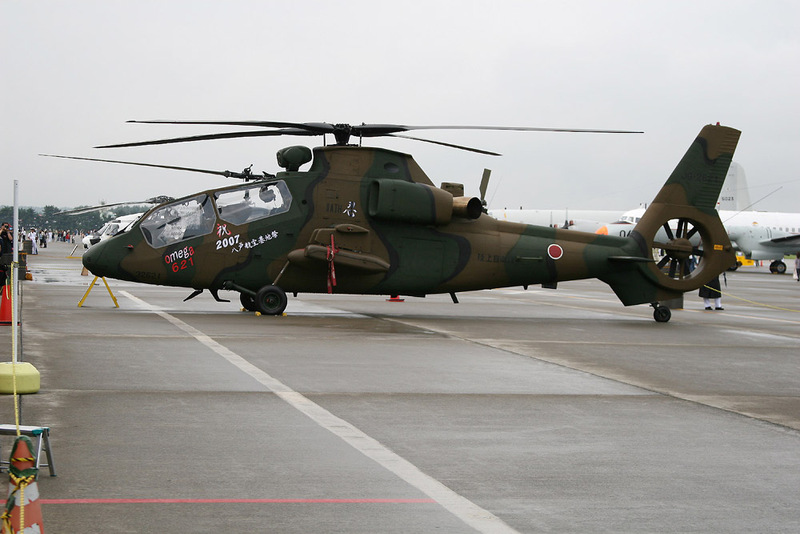 The same site contains images (link) of 2nd ATH OH-1s that were present at the JGSDF Kita-Utsunomiya air show in May 2006, the same JMSDF Hachinohe event in 2006 as well as in 2007. One shot at the latter (link) shows the 21st and last OH-1 built, hence the ‘Omega 621’ on the nose. Below the kanji 祝 (iwai, meaning ‘congratulations’), the Japanese written under the cockpit reads ‘2007 Hachinohe Air Base Show’. The marking beneath the main rotor is too difficult to identify. 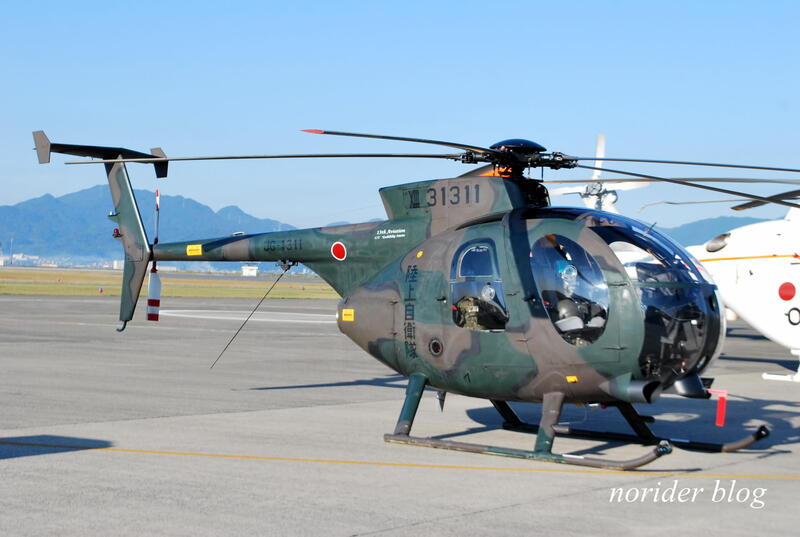 All taken at Kasuminome, the first photo from another site (link) shows one of two 2nd ATH aircraft that, along with an OH-1, debuted in winter camouflage in January 2010. Taken a month later, in February 2010, the second photo (link) shows the second aircraft from the right-hand side, its garish camouflage looking incongruous and hardly effective against the backdrop formed by the city of Sendai. Third and more recently, an aircraft in standard camouflage in September 2016 (link). An OH-1 in 2nd ATH Unit markings being put through its paces at Kasumigaura in May 2014.
prefixed by a Roman numeral. 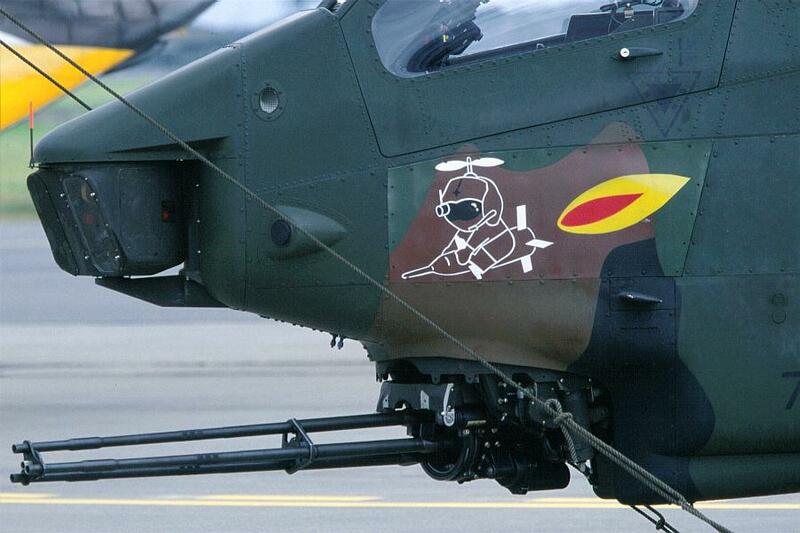 JGSDF helicopters often sport unit badges and, on occasion, nose art. Comprising a missile-straddling mascot, wearing a helmet equipped with a sight and bamboo dragonfly toy-like rotor, this example (link) was seen on a 2nd ATH Unit AH-1S at JASDF Misawa in September 2003. According to the unit’s website page (link), an office to oversee the formation of what was to become the 3rd ATH Unit was set up on March 24, 1989. The office was upgraded to unit status in preparation for squadron formation on August 11 that year, exactly a week after the completion of an AH-1 hangar. The squadron inauguration formalities took place on March 26, 1990. On June 6, 1991, the unit was sent to assist in the disaster relief operations following the eruption of Mt. Unzen/Fugendake in Nagasaki Prefecture. The installation of an AH-1 simulator at Metabaru was completed on October 14, 1993, and live-fire training conducted in the United States in September of each of 1994, 2000 and 2002 as well as in August 2007. The 3rd ATH made its debut at the Fuji live-fire demonstration in August 1995.
close to the ground at Takayubaru, Kumamoto Prefecture, on May 30, 2010. Having received its first OH-1 on February 9, 2006, the unit was declared at full strength with four aircraft on February 15, 2008; a hangar to house the OH-1s had been completed on April 5, 2006. An AH-64 first joined the ranks in 2009, the year before the unit’s 20th anniversary. Four photos taken on the day of the anniversary, March 13, 2010, can be found here (link). Like its sister units, 3rd ATH aircraft an identification alphanumeric code, in this case IIIATH. 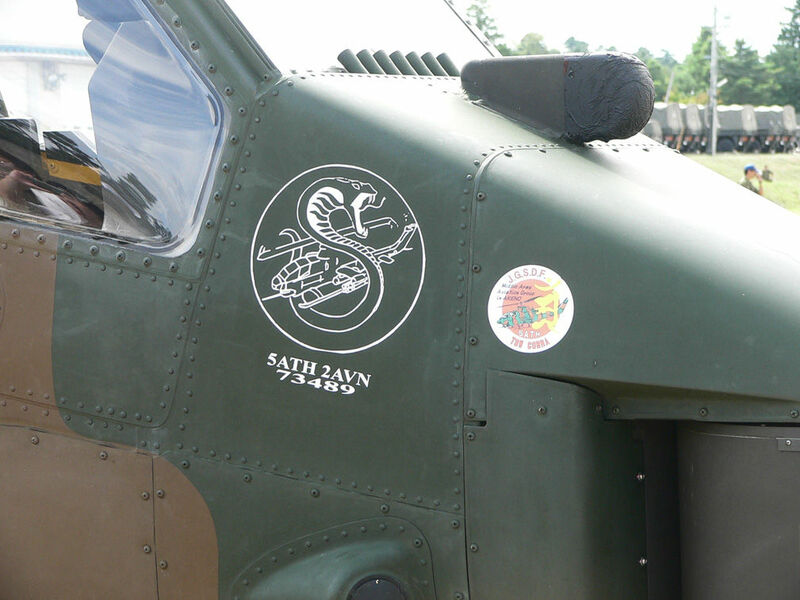 Seen in the previous photo link, an AH-1S was painted in a suitably serpentine marking on the occasion of the unit’s 20th anniversary in 2010 (link). The previous year, a similar but winged serpent design had been adopted by the 3rd ATH for the 48th anniversary of the Western Region Army (link), wording to that effect appearing on a plaque, framed by the snake’s tail, on both sides of the engine. The right side of presumably the same aircraft (link) and nose unit badge (link) were photographed at the Air Memorial event at JMSDF Kanoya in May 2009. 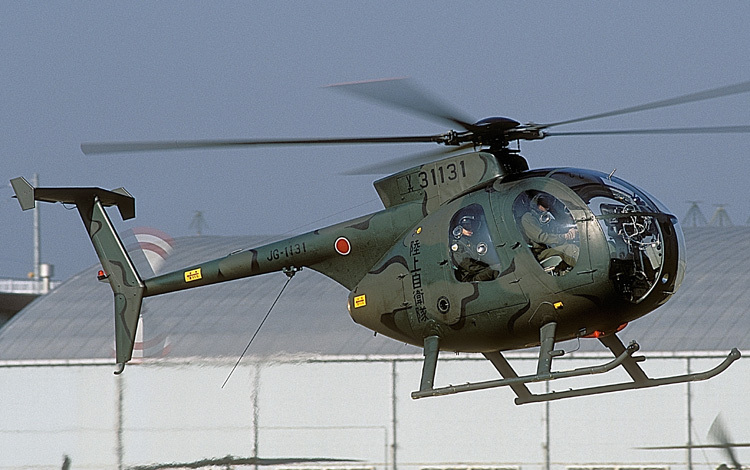 An OH-6D assigned to the 3rd ATH was at the JASDF Nyutabaru air show in November 1993 (link). The Metabaru-based 3rd ATH marking seen on the nose of an AH-1S visiting Takuyabaru in April 2003. Assigned to the Eastern Region Army upon its formation in March 1992, the 4th ATH notched up its 25th anniversary as a Kisarazu resident in 2017. Despite being assigned to the capital region, this unit has no dedicated web page. A photo report in Japan Self-Defense Force Squadron (sic) (Ikaros Publications, Summer 1996), showed elements of the unit during two weeks of training at the U.S. Army’s Yakima Training Center in the state of Washington in November 1994, when three AH-1Ss and one of the unit’s two OH-6Ds were deployed. At the time of the Kisarazu visit to gather material for JSDF Squadron in late April 1996, the 2nd Sqn was away on deployment training, leaving the 1st Sqn to man the fort. The report covered a training mission by the three-aircraft 1st Flight, which at that time was commanded by a Major Hiratsuka, at 35 already referred to as a veteran pilot. The report describes, from the pre-flight briefing, a standard six-hour training mission, involving heading south and following the Tanba Highway for a refueling stop at Takigahara Army Camp in Shizuoka Prefecture before undertaking training at the North Fuji Maneuver Area. Night training was taken on the return flight to Kisarazu, where the aircraft landed at 21:00. The head of the flight section who had given the pre-flight briefing, Major Nakamura said that, aside from its combat training, the squadron had assumed responsibilities for post-disaster reconnaissance missions since the Great Hanshin-Awaji Earthquake of January 1995. In the event of an earthquake in the Tokyo metropolitan area, 4th ATHS aircraft would be rapidly launched on damage assessment and information gathering missions. 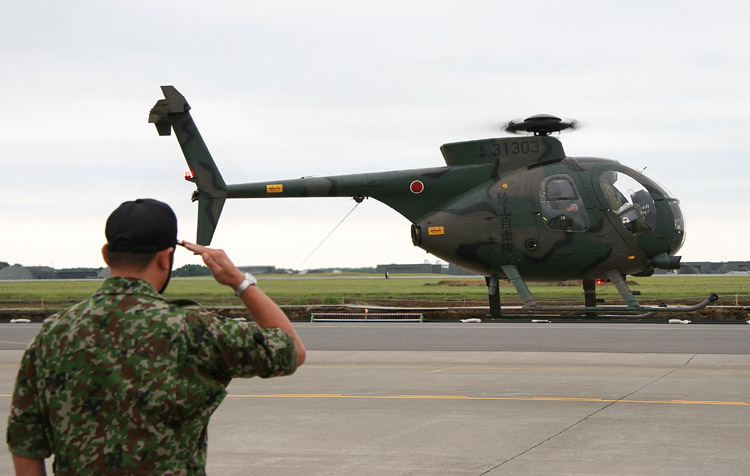 Helicopters are regularly used for PR and recruitment purposes at events held at JGSDF garrisons. Filmed in April 2017, YouTube footage (link) records the arrival and setting up for static display of a 4th ATH Unit AH-1S at Shibata Army Camp, Niigata Prefecture, which was marking the 62nd anniversary of its establishment. Like its sister units, the 4th ATH carries an identification alphanumeric code, IVATH. The 1st Flight and HQ Flight are devoid of other identifying marks, but 2nd Flight aircraft have a short white diagonal stripe beneath their rotor masts. An OH-6D of the 4th ATH Unit’s HQ Flight, which is now equipped with the OH-1, was at Gifu for overhaul in October 1997 (link). For the Kisarazu air show in late October 2011, when the nation was still recovering from the effects of the Great East Japan Earthquake the previous March, a 4th ATH AH-1S (link) was painted in a design that mixed a sharkmouth with an anime character, cherry blossoms and a slogan of encouragement in assisting those in the tsunami-affected areas: With One Heart, Let’s Do Our Best Japan! The names of the unit’s eight crew chiefs were listed on the sides of the engine cowlings. The OH-1 on display that day (link) had a more subdued design comprising a ninja, the aircraft’s unofficial and ill-suited nickname—the noise of its engine hardly enables a stealthy approach—and the Japanese for ‘Kisarazu Air Show 2011’ in black on the nose. seen clearly here (link) at the Matsudo Army Camp, Chiba Prefecture, in October 2012.
mark the 20th anniversary of the resident 4th ATH. static display at JASDF Komatsu AB, Ishikawa Prefecture, on Sept. 18, 2005. Posted in July 2012, a YouTube video (link) shot at Akeno (and in need of editing) includes footage (at the 2:27 mark) of a 5th ATH AH-1S. A video showing the takeoff and display of a 5th ATH AH-1S at the Crossland Oyabe Helicopter and Fire/Crime Prevention Festival in Toyama Prefecture in August 2017 can be found here (link). Mentioned elsewhere on this website (link), the event offers the unique opportunity to take photos from above helicopters in flight (link). Like its sister units, the 5th ATH carries an identification alphanumeric code, VATH. This photo (link) shows an OH-6D assigned to the 5th ATH at Akeno in March 1999. In 2004, the Akeno open day was confined to indoor displays due to a passing typhoon. The following day, aircraft that had been “confined to barracks” were pulled out from their hangars in the fine weather that usually follows. 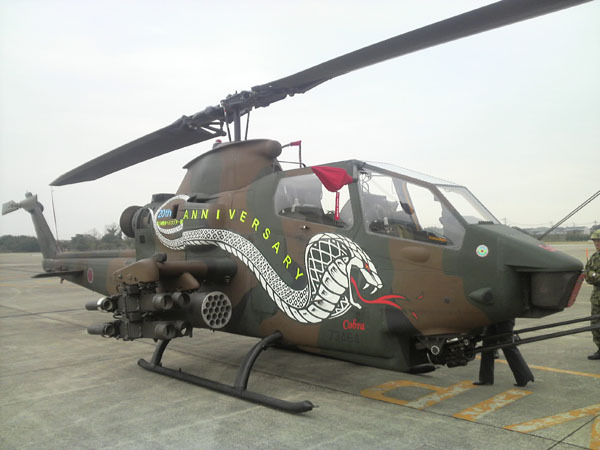 The aircraft included an AH-1S with a fuselage-length white snake marking, bearing the words MA AVIATION 50th Anniversary, MA referring to the founding of the “middle army” (officially the Central Region Army) of the JGSDF (link). along with a reference to its Tube-launched, Optically guided, Wireless-guided missile armament. 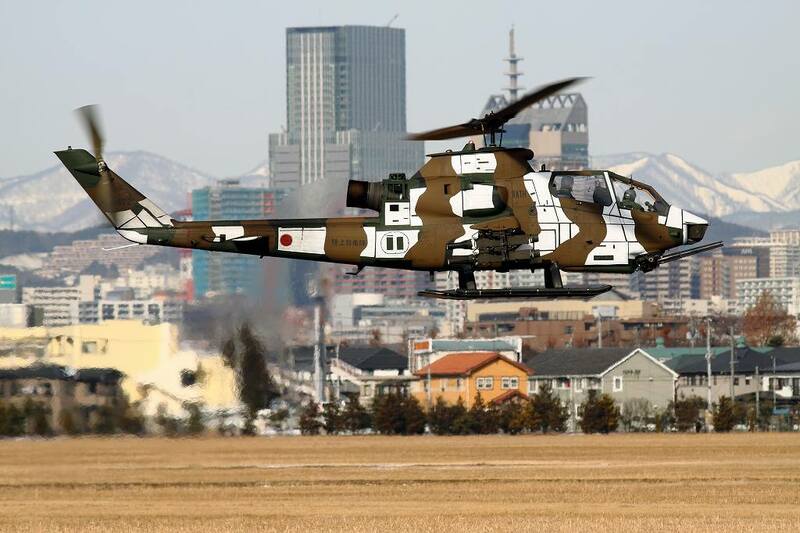 For the JGSDF’s 60th anniversary in 2014, an AH-1S in standard camouflage (link) sported two unit nose markings (link), one of which was a colour sticker (link). Dating back to the NSF’s short-lived Northern District organization, what had become the JGSDF’s Northern Army Aviation Corps on July 1, 1954, was reformed into the Northern Army Aviation Group on January 18, 1962. The Group then incorporated three former NSF/JGSDF District Aviation Corps as hikōtai (aviation squadrons) —the 2nd (at Asahikawa), 5th (Obihiro) and 7th (Okadama)—plus the newly formed 11th at Kita-Chitose and the Northern Army Aviation Squadron at Okadama. An aviation corps that had been attached to an artillery brigade was disbanded at that time. A Northern Army Aviation Group L-19A arrives back at Okadama in August 1973. 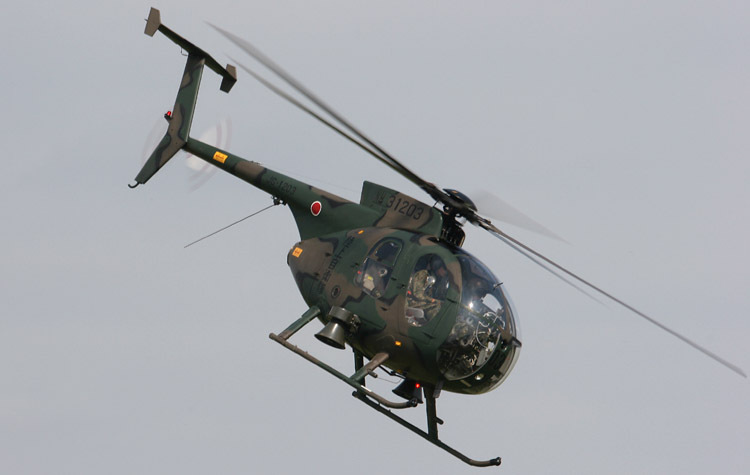 The formation of the Northern Army Helicopter Squadron on March 1, 1968, was followed by that of the 1st Anti-Tank Helicopter Unit at Obihiro on March 25, 1986. On March 28, 1994, all four aviation squadrons were passed to division-level command. The Northern Army’s own aviation squadron disbanded and its OH-6 flight incorporated into the Northern Army Helicopter Squadron, its LR-1 flight reformed as the Northern Army HQ Flight. The Northern Army LR-1 (above) and LR-2 were both present at a wet Okadama on October 14, 2007. A handful of other photos can be found at the unit’s dedicated page on the Okadama Army Camp website (link). The wholesale reorganization of the JGSDF that took place January 18, 1962, resulted in the Kasuminome-based 6th District’s 6th Aviation Corps being joined by the 9th from Hachinohe and re-designated hikōtai (aviation squadrons) under the command of the newly formed Northeastern Army Aviation Group. The Northeastern Army Aviation Squadron was also newly formed on that day. 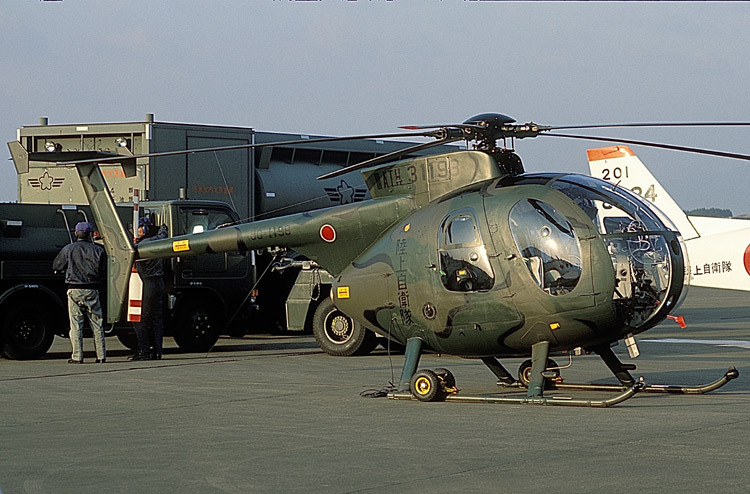 The Northeastern Army Helicopter Squadron came into being on March 1, 1968, also at Kasuminome, but moved to Jinmachi Army Camp (Yamagata Airport) on March 6, 1969. 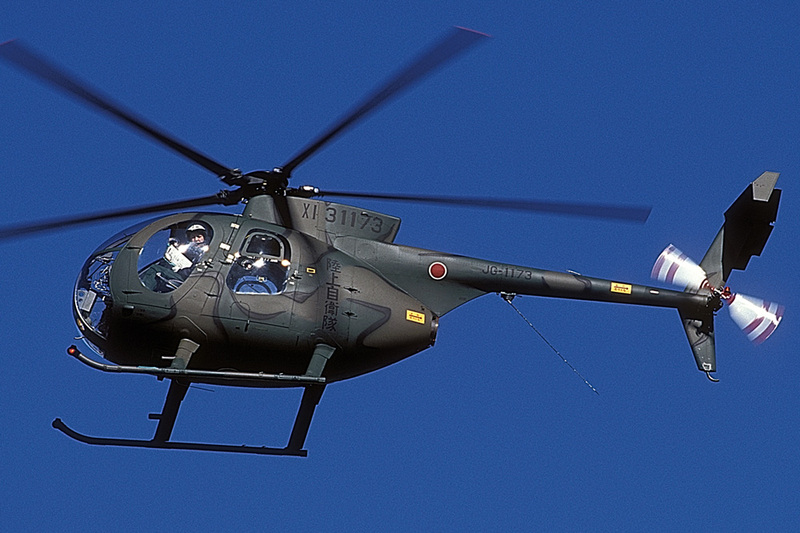 The 2nd Anti-Tank Helicopter Unit formed at Hachinohe on March 25, 1988. On March 28, 1994, the two aviation squadrons were passed to division-level command, and the Northeastern Army Aviation Squadron reformed as the Northeastern Army HQ Flight. On January 18, 1962, the Kasumigaura-based 1st District reorganized its 1st Aviation Corps into the 1st Aviation Squadron under the Eastern Army Aviation Group. In this case, the co-located newly formed sister unit was designated the 12th Aviation Squadron, which was newly formed with the Eastern Army Aviation Squadron. Only around 10 months were to pass before the Eastern Army Aviation Group’s HQ was relocated to Kita-Utsunomiya. Back at Kasumigaura, the Eastern Army Helicopter Squadron was newly formed on August 1, 1969. It was the regional entity’s turn to move in 1972, an advance guard that formed at Tachikawa in Tokyo on March 7 being joined by the main force on December 27 of that year; the HQ moved from Kita-Utsunomiya on May 3, 1973. 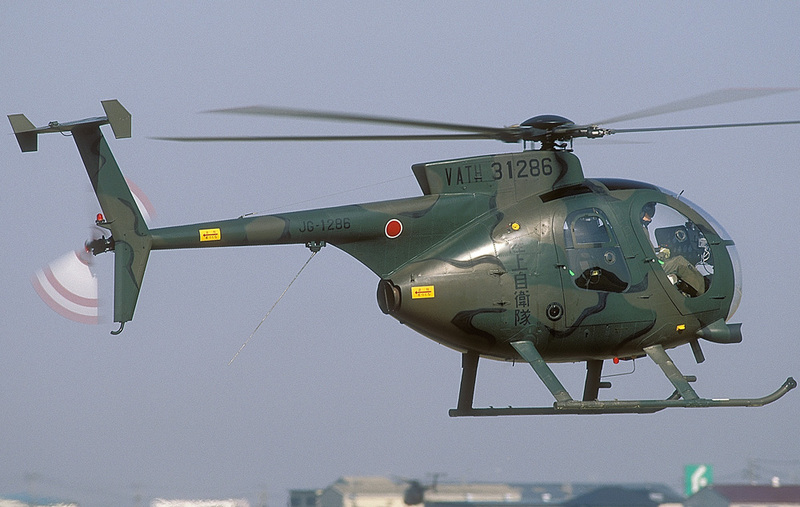 The region’s 4th Anti-Tank Helicopter Unit joined the ranks at Kisarazu on March 27, 1992. On March 28, 1994, the 1st and 12th aviation squadrons were passed to division-level command, and the Eastern Army Aviation Squadron reformed as the Eastern Army HQ Flight. According to its Japanese-language website (link), the geographical extent of the Eastern Army’s defense and disaster relief responsibilities encompasses the Tokyo metropolitan area, the 10 prefectures of the Kanto and Koshin’etsu regions (including Sado Island off the coast of Niigata Prefecture) plus Shizuoka Prefecture. The land area covered amounts to around 70,800 sq. km, or nearly 20% of Japan’s total land mass, and its 51.7 million inhabitants represent 40% of Japan’s total population and also 40% of the nation’s gross domestic product. The Sea of Japan and Pacific Ocean coastlines extend for 600km and 1,600km, respectively. The Tokyo Metropolitan Government-administered area, and with it the Eastern Army’s remit, also includes no less than 481 islands in the Pacific Ocean, 16 of which are inhabited. The latter extend from Izu-Oshima (a mere 100km away to the south), the Ogasawara (Bonin) Island chain (1,000km) and Iwo To (formerly Iwo Jima, 1,200km) to Japan’s most easterly point, Minami-torishima (the Marcus Islands atoll, 1,848km away to the southeast). The latter is actually home to a Self-Defense Force and Japan Coast Guard presence, including a runway that can accept supply flights made by JASDF, JMSDF and JCG transport aircraft. The JGSDF has historically always referred to its Central Army as its Middle Army, hence MA Aviation Group appears on the badge shown on the unit’s website (link). Formed on January 18, 1962, the Central Region Aviation Group comprised the existing 3rd District’s 3rd Aviation Corps at Yao and the 10th District’s 10th Aviation Corps at Akeno, which were made into aviation squadrons. Newly formed on that day were the 13th Aviation Squadron, which moved from Yao to Hofu in November that year, and the Central Army Aviation Squadron. The Central Army Helicopter Squadron was newly formed on March 1, 1968. Found in a hangar at Yao in March 1980 were the Central Army’s LM-1 (above) and LR-1. On March 28, 1994, the 3rd and 10th and 13th aviation squadrons were passed to division-level command, and the Central Army Aviation Squadron reformed as the Central Army HQ Flight. The region’s 5th Anti-Tank Helicopter Unit became the last of its kind to form at that time and was declared fully operational in June that year. In March 2006, operation of the Central Army HQ Flight’s LR-1 was transferred to what was now termed the Liaison/Reconnaissance Flight. Three years later, in March 2009, a unit charged with preparing for the formation of the 14th Aviation Squadron was set up within the HQ organization; the process was declared complete on March 26, 2010, when the 14th officially joined the ranks under the command of the 14th Division. The next major re-equipment process, of supplying the Central Army Aviation Squadron with OH-1s, was commenced on February 16 and completed on March 27, 2012. In 2014, the unit’s 16 aircraft were called upon to assist when major landslides struck parts of the city of Hiroshima in August and during the heavy snowfall in Tokushima Prefecture in December as well as to relay images taken from the air in the aftermath of natural disasters. Professionally filmed at Yao by SankeiNews on January 13, 2015, this short YouTube video (link) shows the Central Army Aviation Group’s first flight of the year. Having already been formed at Ozuki on January 1, 1956, the Western Army Aviation Group moved to the JGSDF’s Takumabaru Army Camp (the location of today’s Kumamoto Airport) on August 20, 1957. On January 18, 1962, the local JGSDF aviation elements in western Japan followed the example of the other regions by forming aviation squadrons, the 4th from the existing 4th District’s 4th Aviation Corps alongside the newly formed 8th, both at Metabaru. Also newly formed at Metabaru was the Western Army Aviation Squadron. During the course of 1971, the 8th Aviation Squadron and the Western Army Aviation Squadron moved from Metabaru to Takayubaru. (*) A long-term resident of Oita City, aviation photographer Takao Kadokami has kindly made a large number of his photos available to J-HangarSpace. Living in Kyushu meant that he was well placed to capture on camera many of the aviation events in that part of Japan, including the comings and goings of JGSDF Western Region aircraft at Oita Airport. One of his earliest photos, a November 1955 image of a school friend standing in front of a JGSDF L-5A Sentinel at Oita, graces this website’s homepage. On March 28, 1994, the 4th and 8th aviation squadrons were passed to division-level command, and the Western Army Aviation Squadron reformed as the Western Army HQ Flight. In other rotorcraft developments, the Western Army Helicopter Squadron was newly formed on March 1, 1968, the region’s 3rd Anti-Tank Helicopter Unit on March 26, 1990. Initially equipped with the AH-1S, the latter was also supplied with its first AH-64 on March 12, 2010. Spanning the years 1959 to 1977, the following is a chronological selection of more photos from Takao Kadokami’s archives. February 1959. This aircraft was written off in a crash on May 14, 1973. The Western Army Region representative OH-6J departs the November 1977 JASDF Nyutabaru airshow. Having formed on March 1, 1968, the Northern Region Helicopter Squadron supported the 1972 Winter Olympics in Sapporo. On March 28, 1994, the Northern Army’s own aviation squadron disbanded and its OH-6 flight was incorporated into the Northern Army Helicopter Squadron. The unit surpassed the 51,000 accident-free hours in 1996. The Northern Ladybirds putting on a show at Sapporo airfield, Hokkaido Prefecture, in June 2003. Aside from regular training exercises covering every eventuality, domestic disaster relief operations have included the 1993 Hokkaido earthquake and the volcanic eruption of Mt. Usu, Hokkaido Prefecture, in 2000. Overseas, the unit was part of the international earthquake relief operations in Pakistan in 2005 and, in contrast, took part in live-fire missile training in the United States in 2006. The Northern Army Helicopter Squadron celebrated its 40th anniversary at Okadama on March 1, 2008. In terms of equipment, the first of the then new OH-6Ds was received in 1994, the first OH-1 in 2011. The unusual sight of one of the Northern Army Helicopter Squadron OH-6Ds fitted with twin loudspeakers was recorded at Okadama in September 2005 (link). Other photos can be found on the unit’s dedicated page on the Okadama Army Camp website (link). These include a UH-1J close to the Mt. Usu volcano in 2000 and two images of the relief operations in Pakistan in 2005. All NAH UH-1Js carry the unit badge (above) on the nose. The text on the ribbon of the badge reads (left) 1st Aviation and (right) Camp Okadama Sapporo Japan. Written at the bottom of the shield are (left) a reference to 1968, the year of the unit’s formation, and C/C. 1st Flight UH-1Js have a white fuselage stripe, the 2nd Flight a forward-pointing chevron. The HQ Flight carry no markings other than the NH unit identification code common to all aircraft. The Northeastern Army Helicopter Squadron came into being at Kasuminome on March 1, 1968, but moved to Jinmachi Army Camp (Yamagata Airport) on March 6, 1969. In early October 2016, a roving blogger captured some fine images of Northeastern Helicopter aircraft at a helipad close to Semine airfield in northern Miyagi Prefecture, which was holding the 11th Kurihara Autumn/Dream Festival. 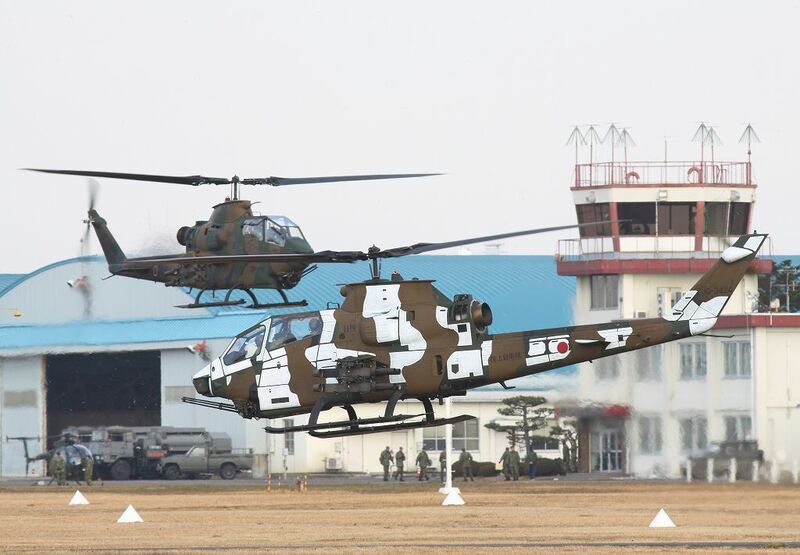 Two images of the JGSDF participants in this general aviation event show the right (link) and left (link) side of the same OH-6D parked and another (link) of the aircraft in flight. Other images show the unit badge on the cockpit door of a UH-1J (link) and the two aircraft in formation (link). Formed from the 2nd Hikōtai of the 1st Herikoputadan’s 2nd Herikoputatai on August 1, 1969. Following the decision to move the regional entity to the Tokyo area in 1972, an advance guard that formed at Tachikawa on March 7 was joined by the main force on December 27 of that year; the Eastern Helicopter Squadron, however, was not relocated to its still current base of Tachikawa until May 3, 1973.
the same as the unit badge. An MH-marked Kawasaki OH-1 visiting JMSDF Maizuru in July 2014. In October 2015, there was a specially marked Central Army Helicopter Squadron OH-1 present for the 60th anniversary of Akeno’s postwar founding as a JGSDF aviation base (link, four photos). In August 2017, a Central Army Helicopter Squadron UH-1J sporting an as yet unidentified nose badge (link) participated in the Crossland Oyabe Helicopter and Fire/Crime Prevention Festival, mentioned elsewhere on this website (link), in Toyama Prefecture. The Western Army Helicopter Squadron was newly formed on March 1, 1968. While two flights were stationed at Metabaru, a third flight was first based at Takayubaru in March 1978. A great action shot of KV-107IIA-4 51815 at a temporary landing area in Oita City in November 1979.
their Takayubaru home base in April 1989; UH-1H 41692 (above) and KV-107II-4 51731. This Western Army Helicopter Squadron OH-6J was photographed at Nyutabaru in January 1984 (link). of all the units with which it had served during a career that had started in 1966 (see top of this page). First seen in April 2001, the marking adopted by the 3rd Flight comprises a black kingfisher holding what has been described as a black and white prosthetic claw. The name KINGFISHERS appears in white-shadowed black lettering beneath. 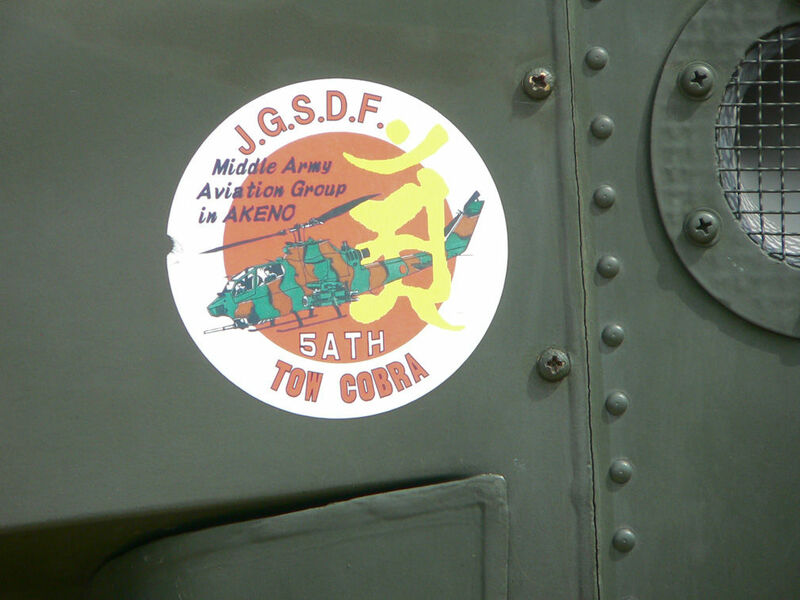 Squadron seen on an aircraft at the unit’s Takayubaru home base in April 2003. 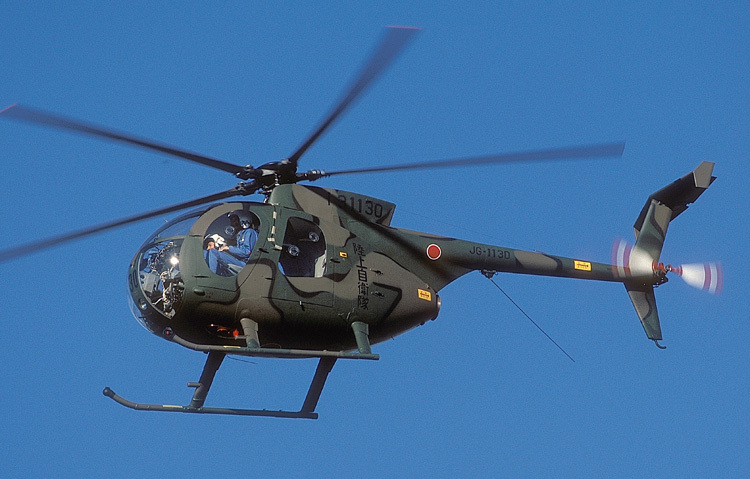 Placed under the command of the 1st Helicopter Brigade, the Special Transport Helicopter Squadron (Tokubetsu Yusō Herikoputa Hikōtai) received its first of three AS332Ls in December 1986. All these were placed in storage at Kasumigaseki following the service entry of three EC-225LPs in March 2006. Helicopter Squadron in 1986 and placed in store after their withdrawal from use in 2006. Upon the formation of the 1st Transport Helicopter Group in place of the unit’s former parent 1st Helicopter Brigade on March 28, 2008, the special transport unit’s English designation remained the same, but in Japanese was changed from hikōtai to tai. instead of ST, three of the then Eurocopter EC225LPs replaced the AS332Ls during the course of 2006. The JGSDF symbol and English motto (above) have been applied to both sides of the current Super Puma aircraft. Depicting a stylized map of Japan being held in cupped hands, the design more closely matches the Japanese version of the motto, which expresses the desire of JGSDF personnel to protect and, should it ever be necessary, defend the country. According to the official Japanese explanation of the design on the Ministry of Defense website (link), the left hand expresses “robustness and strength”, the right “benevolence”. The design is slanted forward by 10 degrees to instill a sense of movement and symbolize the advances Japan is making with a view toward the future. The Hōantai Aviation School that formed at Hamamatsu on October 15, 1952, became the JGSDF’s Aviation School on July 1, 1954. Training operations were commenced from Akeno in August 1955, following the relocation of the training units from Hamamatsu. Placed under Main Aviation School control, an Air Training Support Squadron formed at Akeno on March 25, 1977, and has subsequently operated from both Akeno and the Fuji live-firing range. Located in Sendai, Miyagi Prefecture, the Iwanuma Branch School formed on August 1, 1964 for fixed-wing aircraft pilot training and closed on March 19, 1973. Opened on December 4, 1959. A Branch School-based UH-1H comes into land at Kasumigaura in late May 1983. An OH-1 is towed out of the hangar prior to a display flight at Kasumigaura in May 2008. Assumed responsibility for fixed-wing training on March 19, 1973, the day on which the Iwanuma Branch School was closed. A look at some of the various types of aircraft that have worn the SU identifying letters of the Utsunomiya Branch School since the 70s. One of the two Fuji TL-1s based at Utsunomiya seen on a visit to Tachikawa in November 1989. The above photo shows the JGSDF Sky Hornets display team performing at Utsunomiya in May 1981. Formed in 1974 and made up of instructor pilots, the team initially flew four OH-6Js but by the end had long since transitioned onto the OH-6D and was choreographing five-aircraft routines and, unlike the Blue Impulse, using coloured smoke. In addition to its Utsunomiya home base, the team also participated at Kasumigaura and Tachikawa events. A 10-minute YouTube video exists of their 2012 performance at Utsunomiya (link). J-HangarSpace was present for the 2013 display (below), which comprised two displays interspersed by a rest and refuelling break. 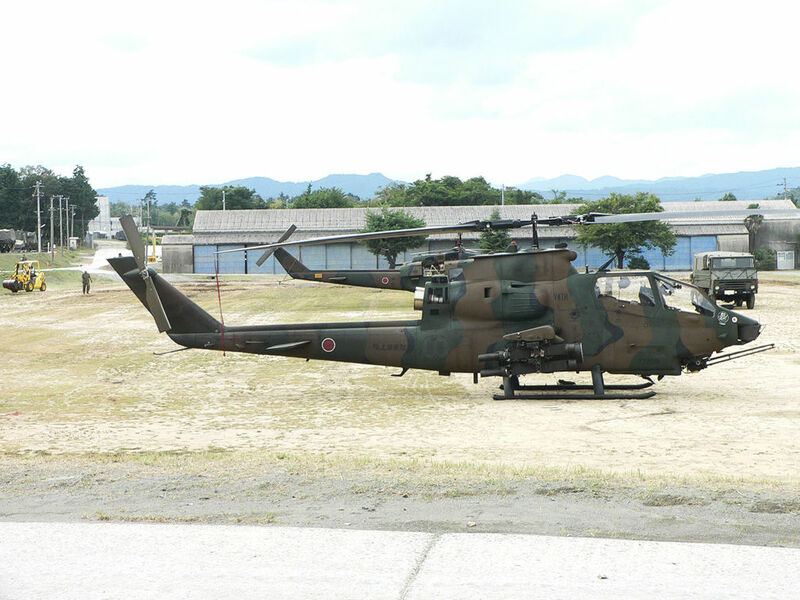 Following the cessation of new OH-6D pilot courses, the team performed its last display at Utsunomiya on May 25, 2014, bringing its 40-year history to an end. Featuring a box art photo by Hajime Ishihara, plastic model maker Hasegawa marked the end of an era by bringing out a limited edition kit (above) of the specially adorned aircraft that was on static display that day. The flying display aircraft had suitably amended signs in their cockpit windows (link). 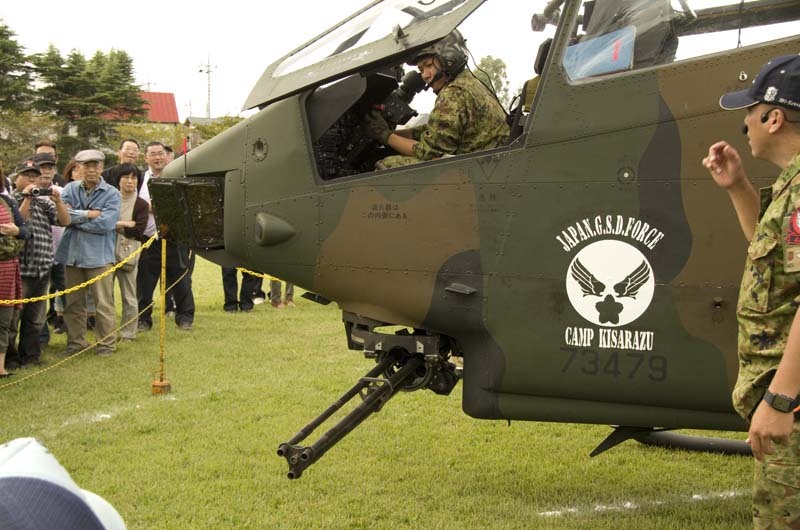 To end with the commemorative marking theme, an OH-6D had been painted and placed on display (above) to commemorate the 40th anniversary of JGSDF Kita-Utsunomiya in May 2013.
career at the Akeno Main Aviation School had ceased in October 1973. Tokorozawa Aviation Museum, Saitama Prefecture, where it is given an annual public airing. 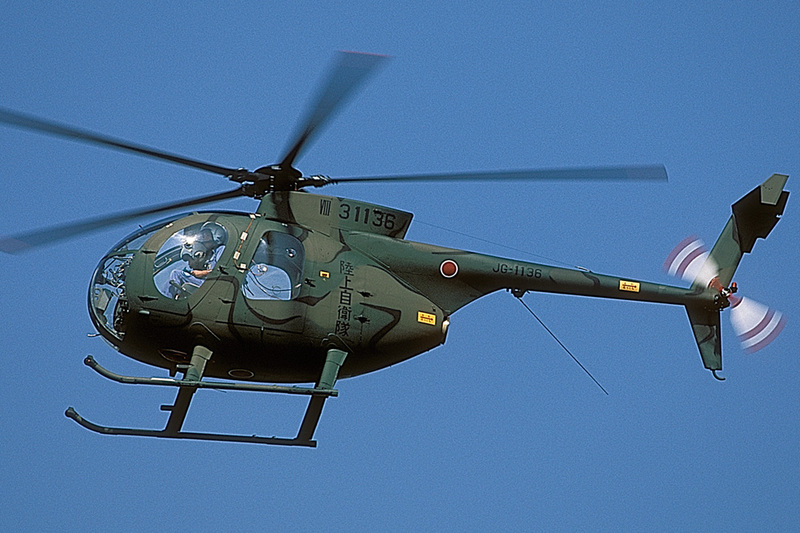 be the JGSDF’s standard observation helicopter; a total of 117 were delivered between 1969 and 1977.
programme. The last entered service early in 2015. Each of two locations, Akeno and Takigahara, houses a Training Support Flight. These have their origins in the Air Training Support Squadron that was formed at Akeno under Main Aviation School command on March 25, 1977. A Fuji-Bell UH-1H assigned to the Air Training Support Squadron. the Naha-based 101st AvSqn from 1996, 52901 was flown for the last time on March 3, 2009.